Finally the beginning of the race is happening! I have been preparing for this race all summer. I was very excited that we were finally beginning the race. Although to be honest- the building of the raft- was the area that I felt the least prepared for- as I have pretty much no mechanical ability. We started off our day with breakfast at our hostel. We then took Moto taxi’s to meet the Race Buses that were going to shuttle us to the starting point of the race. We went by bus from Iquitos, Peru to Nauta, Peru. There were two busses full of racers excited for the impending race. The bus ride last about 2 1/2 hours. The roads are surprisingly good. I enjoyed chatting with some of the other racers. I was sitting next to some high school students from Lima, Peru who were competing in the race. I was surprised to discover that they had not trained at all for the race. We arrived in Nauta a cute little town and many of us lined up to go to the bathroom. Surprisingly this was a new experience for me. What? How could going to the bathroom be a new experience? I have never been to a bathroom with this setup. Outside of the bathroom there was a well that you used to fill a bucket of water and used it to flush the toilet when you were done. I had never flushed a toilet by just pouring water in it. There was a huge celebration that they had chairs lined up in the sun for the racers to sit and listen to many speeches (in Spanish- no clue what was said- although I did gather that they were saying things that were very important- they kept repeating “muy importante” but that was all I could understand). Unfortunately there was no one translating- so about 50% of the racers had no clue what was being said. The presentation lasted about 1 1/2 hours. It was kind of cool- lots of dancing and music. 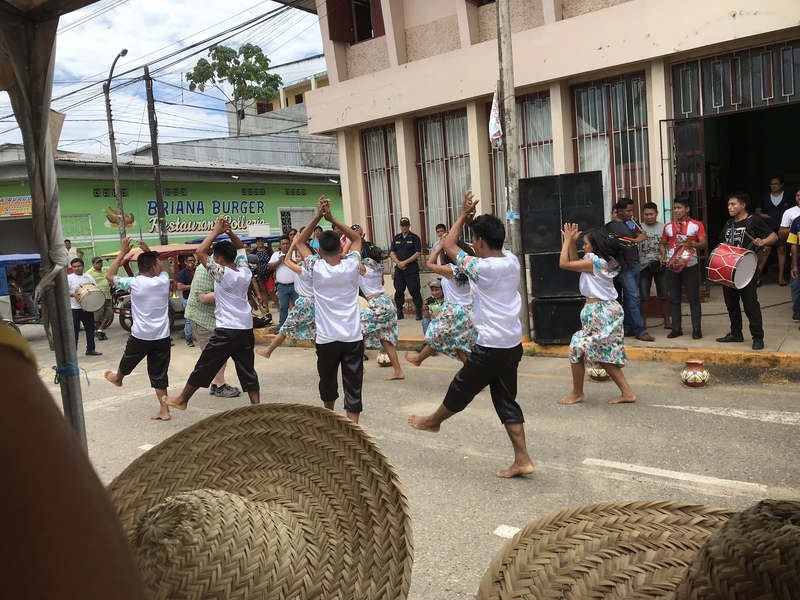 I could not believe that the Peruvians were dancing barefoot on the pavement. The dancers would take turns grabbing different participants to come and dance with them. This was fun. I got a turn to dance in one of the dances. When we arrived in Nauta- I was trying to hurry off the bus. We were told to leave all of our stuff on the bus. I thought this was just a quick stop- so I didn’t get my hat out of my backpack nor did I grab my water. This was a mistake. It was very hot out and I began getting overheated and a little dehydrated. This was the beginning of when I started to not feel well. I had a headache and I was a little nauseous. As soon as the presentation was over I found a little shop to buy a bottle of water. After the celebration they had a hour break for us to go and feed the huge turtles in a pond in a park in Nauta. We then had lunch at 1pm that was provided by the race. It was chicken rice and plantains. After Lunch – the day was rapidly slipping away. We were getting concerned. Although the celebration was really kind of fun. It was starting to get late and we really needed to get to the other side of the river so that we could start building our rafts. As we headed down to the boat to go to the other side. There was a very sobering moment as what looked like a very young Peruvian man-was being carried up from the river on a gurney with IV’s hooked up to him and he appeared to be unconscious. It appeared that before the race had even begun the race had it’s first casualty. I never did find out what happened to him. Finally we got shuttled across the river to build the rafts and the madness began. It was the craziest thing I have ever seen. They had logs piled up in the water and people were all running like crazy to get their 8 logs per raft. It was hard to not slip in the mud or on the logs as you attempted to snag the best logs as quickly as possible for your team. Some of the logs were not good logs and would not work. They did not have enough logs for all the teams. But it was insane. People would fight to grab these huge long balsam wood logs and scurry up to their place on the beach to build their raft. It is amazing no one got hurt from this. The logs were heavy but not as heavy as I would have thought they would be. I didn’t attempt to carry any on my own- because I am a little bit of a clutz and would have likely hit someone in the head with the log-if I had managed to do it. 2 of our 3 teams in our group worked together to get our rafts built. The other group did theirs on their own- and gave us some advice. We had hired some Peruvians to help us with the building of our rafts. If there is one thing I would recommend: hire some people to help with raft building. They work very hard and they know what they are doing better than most of us-who have never built a raft before. We were fortunate to have Jose on my team who is a very hard working Peruvian who has done the race before. I remember watching him as he diligently used the machete to shape the wood into the best shape. He was determined to build an awesome raft. We had a whole crew of people helping. I became the official water girl. My job was to make sure that all of our helpers were getting enough water. So I used some of the water that I had purchased for the race to keep our helpers hydrated. They appreciated it. In addition to that I helped with varnishing our raft-I am not sure if that made a difference or not-but this one of things that our team had purchased in advance. Most teams- just used the supplies given. In general- I would say mostly that is probably fine. But would recommend figuring out seats to sit on. I also think it is helpful to use something to elevate you- to put less strain on your back and hamstrings when paddling. As I mentioned earlier they had run out of logs and had to send the boat to get more logs. This was a-disadvantage for 2 of our teams. We were losing much needed daylight while we waited for the logs to arrive- so we could continue to build our rafts. As it turned out- it got dark and we did not have our rafts done. We were seriously stressing out- what were we to do. And on top of that as it turned out- they did not have enough tents for all the teams. Since we were busy building our rafts we did not manage to snag tents for our teams to sleep in. So- we were not going to have anywhere to sleep. This was the final straw in a crazy day! The race was off to a very bad start! We couldn’t start the race the next day without a raft and we needed a place to sleep. We talked to the race coordinator and she agreed that because we had lost so much time that in the morning we would be able to continue building the raft and they would delay the start until we finished our rafts. Although not ideal- it was the only option. She solved the sleeping problem by shuttling us across the water to Nauta where we stayed in a hotel. The nice thing about this was that we were able to shower- a true treat! I was covered in varnish and this was wonderful to be able to wash up some of the layers of dirt and grime off of me. They served us an extremely late dinner at the same place we had lunch. It was not the most palatable. It appeared to be a dish that they made out of the leftovers from lunch. We later found out that they had fed the people in the tents an extremely late dinner. This race definitely could do with a little more organization. Some of the members of our group had done the race before and said that unfortunately this year- things were very disorganized- it hadn’t been like this in years past. On the bright side- I did get to watch a beautiful sunset on the amazon and saw dolphins. Kate one of my team members also made sure I got my first dip in the Amazon River. While we were waiting for logs she had me cool off in the river. I was freaking out that there might be a Caiman or an Anaconda. All the Peruvians thought it was hilarious! What I have come to realize- after coming home. Yes there are scary things that live in the Amazon- but most of them don’t actually try to hurt you- they avoid you most of the time. And it is much like in the Ocean there are lots of scary things that can hurt you- but you usually don’t see them. In the morning we did get our rafts built very quickly. Stay tuned- for the next post about the paddling portion of the race! Previous Day before the Big Race! Well done, Sarah! The blog was interesting, and the pictures were great. I don’t remember hearing about feeding the big turtles. How did I miss that? Another interesting new experience for you! Obviously you are doing a good job remembering the positive aspects of this experience in Peru. Thanks for sharing it with others.